Professor, Information and Decision Sciences, College of Business Administration, University of Illinois at Chicago, 2014 - . 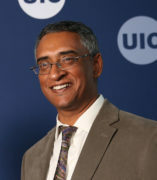 Assistant Professor, Information and Decision Sciences Department, College of Business and Administration, University of Illinois at Chicago, August, 1997 - 2002. Visiting Researcher, Olsen and Associates, Research Institute for Applied Economics, Zurich, Switzerland, Summer 1996, 1997. Customer Engineer (computer systems customer support) with ORG Systems, Baroda, India, 1986-1989. Zhang, K., S. Bhattacharyya, S. Ram , “Empirical analysis of implicit brand networks on social media”, Proc 25th ACM Conference on Hypertext and Social media (HT-14), Sept 2014. Bhattacharyya, S., “Confidence in Predictions from Random Tree Ensembles”, Knowledge and Information Systems (invited issue, selected papers from IEEE International Conference on Data Mining), vol. 35, no. 2, 391-410, 2013. Alfaro,I., S. Bhattacharyya, M.B. Watson-Manheim.” Organizational Adoption of Social Media in the USA: A Mixed Method Approach”, Proc European Conference on Information Systems (ECIS-2013). Alfaro, I., Bhattacharyya, S., Highlander, J., Surakshith, S.M., Watson-Manheim, M.B., “Opening the Social Media Black Box – A Feature-Based Approach,” Proc European Conference on Information Systems (ECIS-2012), June, 2012. Bhattacharyya, S., S. Jha, K. Tharakunnel, C. Westland, “Data Mining for Credit Card Fraud – A Comparative Study”, Decision Support Systems, vol. 50, no. 3, 602-613, 2011. Bhattacharyya, S. and S. Ohlsson, “How Network Structure Affects Social Creativity”, Proc 3rd IEEE International Conference on Social Computing (IEEE SocCom), October, 2011, MIT, Boston. Bhattacharyya, S. and S. Ohlsson, “Social Creativity as a Function of Agent Cognition and Network Properties: A Computer Model”, Social Networks, vol. 32, no. 4, 263-278, 2010. Tharakunnel, K. and S. Bhattacharyya, “Single-Leader-Multiple-Follower Games with Boundedly Rational Agents”, Journal of Economic Dynamics and Control, vol. 33, no. 8, 1593-1603, 2009. PhD, University of Florida, Gainesville, August, 1993. Decision and Information Sciences, College of Business Administration.